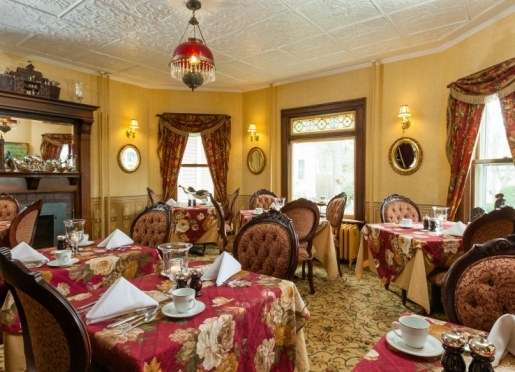 Our 1899 Woodstock VT bed and breakfast is conveniently located in the heart of Woodstock village - just a short walk from numerous art galleries, wonderful shopping and dining, and all that a romantic vacation in Woodstock Vermont has to offer. With convenient access to nearby Quechee, Barnard, Hanover, Killington, Bridgewater, and White River Junction, our Woodstock VT inn is close to many central Vermont attractions and activities. 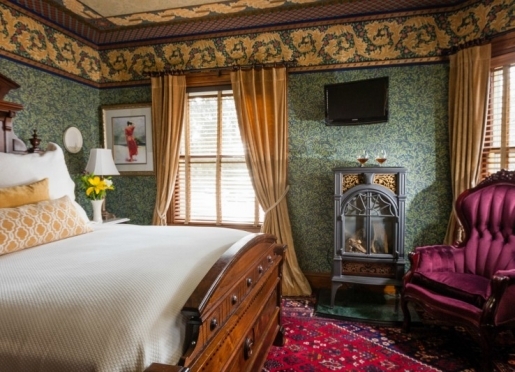 Our luxurious Woodstock Vermont lodging accommodations include a two-room suite and eight pampering guestrooms. 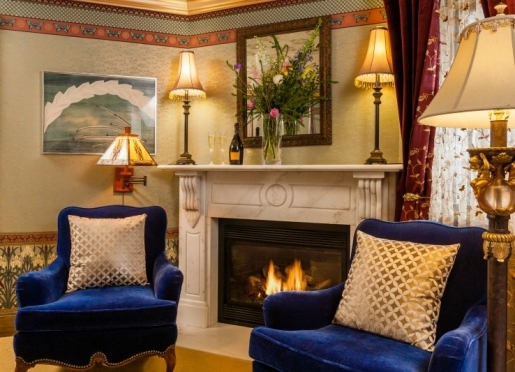 Lodging amenities include a three-course gourmet breakfast, some rooms with spa tubs and fireplaces, all with luxurious linens and gorgeous decor. Relax and enjoy our guest tavern, gorgeous seasonal gardens and front parlor and porch. Our breakfasts are made from scratch and feature ingredients from local Vermont farms and purveyors within an hours drive from Woodstock, VT and our inn. As the only village of Woodstock B&B with an outdoor terrace, we pride ourselves in the lovely spring and summer Woodstock Vermont vacation environment we have created for our guests. 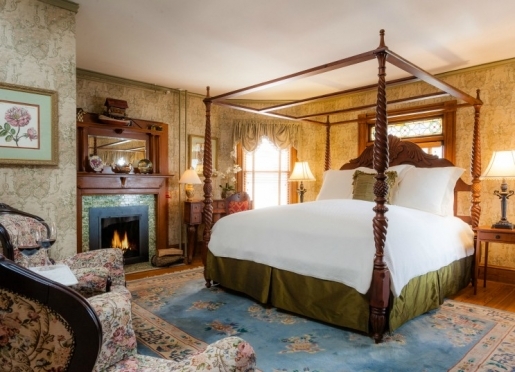 Lovingly treasured over the years, our beautiful Woodstock Vermont bed and breakfast features exquisite attention to detail that whisks you back to a more elegant time. 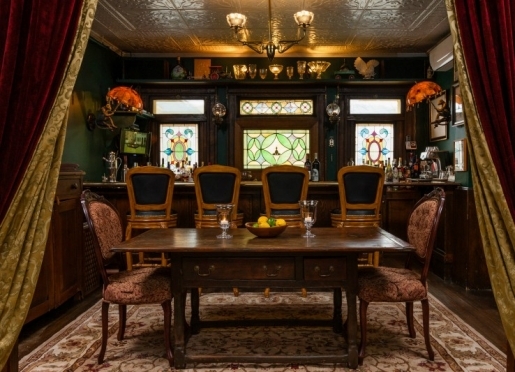 Original oak wainscoting and moldings, ornate tin ceilings, and cranberry glass lamps mix with stunning chandeliers, custom heavy draperies and hand-printed Bradbury and Bradbury wallpaper added by owners/innkeepers David and Evelyn Brey. Yet this Woodstock Vermont painted lady is anything but stuffy! You'll notice David's whimsical art pieces hanging alongside the more traditional paintings of his mother -Susan Brey. And, chances are our furry innkeepers, Spanky and Alfalfa, will scamper between your legs sometime during your stay. Working with Simon Pearce and other notable Woodstock, Vermont attractions and destinations, we've created special Woodstock VT getaway packages and Vermont vacation specials. 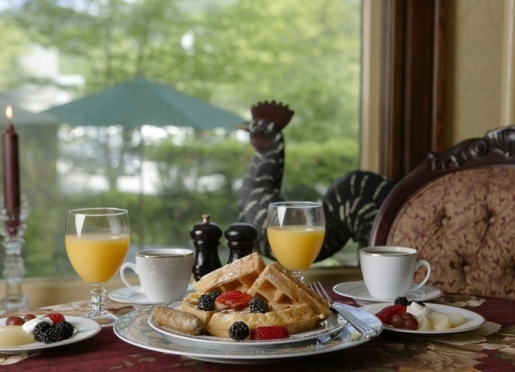 An exceptional farm-to-table breakfast at our Woodstock, VT bed and breakfast starts your day on the right foot and is included in your stay. Enjoy your own private table for a more intimate affair in the dining room or on the gorgeous terrace in the warmer months. Tantalize your taste buds with fresh squeezed orange juice or a Mimosa accompanied by fruit, followed by a delightfully sinful homemade pastry. For your main entrée, savor the choices – David’s entree of the day, farm fresh eggs prepared to order, or homemade granola, all accompanied by Green Mountain Smokehouse bacon or David’s fabulous homemade sausage. Choose from Evelyn’s three homemade breads: Oatmeal, Irish Farmhouse Wheat or English Muffin Toasting Bread. What makes us different is our meticulous selection of the finest products from local Vermont farmers and suppliers. If we can buy locally we do so year-round with as many products as possible. It is our commitment to excellence and the recognition and celebration of the small to mid-size farmer. A lot of passion and hours of labor from a large number of people went into making the incredible breakfasts at our Woodstock, VT inn. This isn’t an ordinary breakfast. You are worth it. Enjoy! Eggs: Rocky Ridge Farm in Hartland, Vermont. Eggs are organic from free-range chickens. Pork: Green Mountain Smokehouse, Windsor Vermont. All things pig come from them – bacon, maple breakfast sausage and ham – we rotate, bacon one day, sausage the next. Ham is used in quiches and omelettes. They also make Bratwurst for both Long Trail Brewing Co. and Harpoon Brewery. 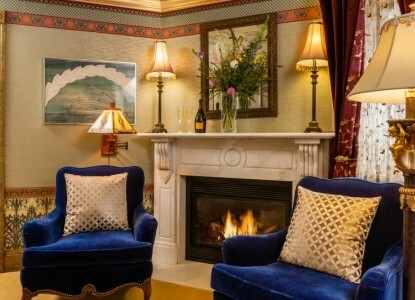 As the only village of Woodstock B&B with an outdoor terrace, we pride ourselves in the lovely, contemplative atmosphere we've created for guests to our Woodstock Vermont inn. Purchase a glass of wine in our Tavern and stroll out to a shaded table or sunny spot for a serene place to sip. Curl up on a cushioned bench with a book, or simply gaze at the trickling fountain and colorful flowers. From late Spring through Fall, our terrace is a great place to hang out after a day of discovering the many active and relaxed activities of central Vermont. Natural beauty, historic homes, covered bridges and elegant shops lure visitors to Woodstock, Vermont year after year. Combine these attributes with nearby central Vermont attractions such as alpine skiing, cross country ski touring, romantic sleigh rides, biking, hiking, horseback riding, canoeing, golf, tennis, and basking in the sun at one of the many lakes in the region and you've got a year-round destination! Enjoy a day on the water. Take a self-guided canoe, kayak or raft trip on a pristine section of the Connecticut River in Windsor Vermont. Rentals are available through Great River Outfitters, and North Star Canoe Rentals and Wilderness Trail. Fly fishing guide services are available through Green Mountain Troutfitters and Wilderness Trails. Play golf at nearby Woodstock Country Club, home of an 18-hole Robert Trent Jones, Sr. course. Cross country skiing, snow shoeing, fishing, canoeing/kayaking and bike rental are all available at Wilderness Trails in Quechee. Enjoy an old-fashioned horse-drawn sleigh or carriage ride. Carriage Rides leave right from our front door. You can arrange your ride directly with Peter or Beth Mantello of Three Brothers Farm, (802) 457-4934. Visit Long Trail Brewery in Bridgewater Corners and Harpoon Brewery in Windsor. See our four covered bridges â€“ one in the center of town, one 4 miles east at Taftsville, the third 3 miles west, and the fourth in Queechee â€“ each spanning the Ottauquechee River. 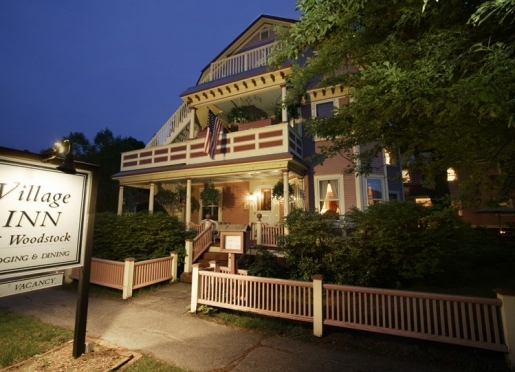 The Woodstock Historical Society , located right in the village in the 1807 Dana House, has changing exhibits that include paintings, decorative arts pieces, textiles, costumes, antique toys, dolls, doll houses, tools and other local items. Guided tours are available. Pentangle Council on the Arts, a non-profit arts council, presents music, theater, dance and family events in the Woodstock Town Hall Theatre, a 400-seat historic theater. The Lebanon Opera House and The Claremont Opera House offer live performances. From Boston: I-93 North to I-89. Follow to Exit 1 (Woodstock/Rutland). Turn left off the exit onto US Route 4 West. Woodstock is 10 miles. The Inn is on the left hand side of the street as you come into town. From Eastern New York & Connecticut: I-95 North or Merritt Parkway to I-91 North. Follow to Exit 10 in Vermont, onto I-89 North. Follow to Exit 1 (Woodstock/Rutland). Turn left off the exit onto US Route 4 West. Woodstock is 10 miles. The Inn is on the left hand side of the street as you come into town. From Upstate & Western New York: I-87 North to Exit 24 (Adirondack Northway). Take Northway to Exit 20 (Fort Anne/Whitehall). Follow NY Route 149 to US Route 4 to Fort Anne. Turn left onto US Route 4 East and follow to Woodstock. The Inn is located 3/10 of a mile east of the Village Green, and is on the right hand side of the street.